As our world decentralizes and the pace of technology accelerates, the need for organizational synchronicity and collaboration is increasing which, in turn, means there is an increasingly urgent need for higher levels of trust and transparency within and across our organizations. The combination of quickly shifting expectations from both the customers we serve and the people we employ means that rapidly innovating is the only way to keep pace with today’s evolving demands. In practice, best-in-class organizational cultures are shifting from managing operations to accelerating innovation through a strong, data-informed design process which can quickly adapt and personalize an experience per a customers’ desires with respect to mission, functionality, and/or brand. Perhaps you’ve seen this begin to manifest itself in the way many cloud-based companies digitally market to their customers by segmenting users into personas and using customer success teams to build persona-specific interfaces and experiences to engage their users. From my point of view, building a market leading rapid innovation capability into your organization’s operations, and behaving like a “Digital Disruptor,” is now more possible than ever thanks to the power of Blockchain technology. The key advancement made possible by Blockchain technology is the smart contract. Fundamentally, what smart contracts do is transparently set, align, and hold accountable all participating parties & their underlying assumptions about how we create, negotiate, & compensate value or collaborate with each other. In concert with Internet of Things devices, and other automations, these technologies form the basis of what is being called a real-time “Metering Economy”. According to Blockchain Revolution’s Don Tapscott, a metering economy is one in which “things like WiFi, electricity from solar panels, Netflix subscriptions, latent computing power, and other household appliances can all be rented out through micropayments and smart contracts”. If you are new to the world of Blockchain and cryptographic signature technology, try thinking about it like this: Today, almost all services and applications send and receive data across networks through a communication protocol known as TCP/IP. A Blockchain-enabled platform replaces that protocol with a distributed ledger that is more secure by being more openly shared, effectively creating a completely immutable single source of truth whose ownership is shared by every participating device. This technology is nothing short of a breakthrough into a native digital medium for value creation, where work is performed by self-service marketplaces of knowledge, and the humans behind that knowledge earn merit or influence based basic income which reflects their contribution in an autonomously negotiated smart contract. 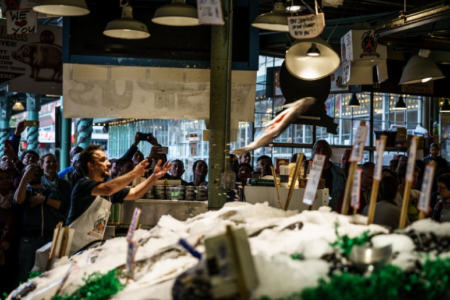 Imagine going out to lunch with a prospective customer or client to the famous Pike Place Fish Market in Seattle. After strolling through the market and watching a few fish fly, you find a food option that’s to your liking and find a space to sit. With Blockchain, in the duration of that meal you could: pay for your food without having to get out your phone or wallet, round up your total to micro-invest in the shop you chose to eat from today, recognize an opportunity to solve a problem with your client; and actually negotiate, contract, begin executing against, and get compensated for that new project without any intermediaries getting involved. Trust and transparency are paramount in the Blockchain protocol, and the world’s largest technology companies and financial institutions are recognizing the potential these solutions offer. By forming Blockchain consortiums across their partner ecosystems, they are blurring the boundary lines between their organizations to make the best use out of, and distribute the risks from, piloting this technology. A company’s access to, and engagement with, marketplaces of talent will soon reach across these ecosystems, and for the employee it will begin to feel as open sourced as the Blockchain technology upon which it is built. As this Metering Economy grows and matures, the potential it offers for transformation of work/life balance is profound. We may soon live in a world where you’re able to instantly transact retail purchases, make investment decisions, and negotiate remuneration through micropayments and smart contracts, just as you would with any other metering service. Naturally, there are still many unresolved obstacles, risks, detractors, and inhibitors to Blockchain’s rise to prominence. Its consequences on the world of intellectual property, for example, could be radical and immense. We’ll do a deep dive on this topic later in our series, but for now, we’re still in seek of the Blockchain version of companies like AirBnB or Uber. A platform for value that is powerful and intuitive enough to be adopted into the mainstream. In my opinion, it’s only a matter of which Blockchain platform will capture the necessary eyes, attention, and market share before we start to see an unprecedented abatement in the wealth & income inequality that has become commonplace throughout much of the industrialized world. We’ll go into this in greater detail in Part 2 of our series, called “Getting Ready for DAOS (Decentralized Autonomous Organizations)”. If we are to make the leap and realize the potential of Blockchain technology, for me, it follows that we’ll soon be able to pair it with technological capabilities like sentiment analysis, machine learning, and artificial intelligence to perform unbiased analyses of an entire workforce’s collective values & opinions. Doing so would allow Boards and executives to consult with an autonomous representative of their workforce, prior to making strategic decisions which are critical to their organization’s identity. By that same token, we could now afford any employee the opportunity for digital recourse – divesting when they see an organization heading in a direction that is contrary with their personal ambitions or values. With the power of Blockchain, we may soon be living in a world where setting your organization’s values, and leading authentically in accordance with those values, would become the single most valuable differentiator and guarantor of your organization’s ability to attract and retain its talent. And that’s why I’ve decided to name this series Enabling Corporate Democracy, because achieving this level of organizational maturity would, in my mind, bring to life what the Supreme Court of the United States referred to as “Corporate Democracy” in 2010’s landmark Citizen’s United vs. FEC case. We could have a digital platform where employees and shareholders are afforded the rights to vote/participate in building and shaping their organization’s identity, in real-time, and with real measures for accountability and recourse. Those who succeed at proving out this concept of Corporate Democracy stand to be the potential beneficiaries of a multibillion-dollar opportunity for shared prosperity across the globe. Anything worth doing is always going to be difficult, but maybe just maybe we can empower millions of people to not only find better livelihoods, but to find self-actualization and even broader purpose in our increasingly automated world.